Tech workers looking to jumpstart their careers have more opportunities than ever, as America's "Top 20 Tech Towns" can be found across 14 states and the District of Columbia, according to a new study released by CompTIA. The 2018 Tech Town Index identifies Charlotte, NC as the nation's top Tech Town, offering the best quality of life for tech workers, factoring in salaries, job availability, job growth and cost of living. North Carolina emerged as a red-hot tech hub with Raleigh earning the number two spot and Durham-Chapel Hill landing at number 15. 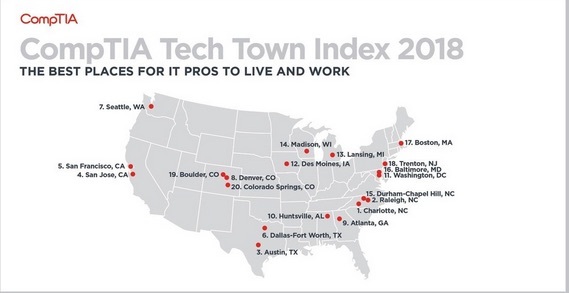 CompTIA's Tech Town Index is designed to help in-demand IT pros make educated decisions about where to live and work based on opportunity and opportunity costs. The index also highlights the need for an educated, tech-ready workforce and the factors that are contributing to each metro areas' ability to attract and retain that workforce. Many cities often thought of as college towns made the list, demonstrating that an abundance of well-educated talent has helped cities such as Boulder, Madison and Lansing blossom into full-on innovation hubs. Several Tech Town up-and-comers including Des Moines, Lansing, Colorado Springs and Huntsville, Alabama secured top 20 rankings. Despite being among the most expensive areas to live in the U.S., tech-heavy hitters like San Jose and San Francisco find themselves at number four and number five, respectively— as employment opportunities continue to outpace the ramifications of housing costs. "As technology permeates every corner of our personal and professional lives, employment opportunities are expanding across the nation and fueling job growth in regions not traditionally thought of as tech hubs," said Nancy Hammervik, executive vice president, industry relations, CompTIA. "The geographic diversity of the index is something we're very excited to see and demonstrates the positive impact the technology industry is having on regional economies." The study comes at a time when the technology industry is fueling economic growth and workforce gains at a rapid pace. The tech industry expanded by nearly 200,000 jobs in 2017 to an estimated 11.5 million total workers. Additionally, at $1.6 trillion, the tech sector is one of the largest components in the nation's economy and is a top-five economic contributor in 22 states. Many tech positions offer salaries significantly higher than other industries. The average annual wage in the tech industry is $112,890, 107 percent higher than the average annual wage for all jobs ($54,420). To determine the 2018 Tech Town Index rankings, CompTIA compiled job posting data over a 12-month period (August 2017-July 2018) focusing on 20 metropolitan areas with populations greater than 250,000, where demand for tech workers is greatest. CompTIA then ranked the cities based on cost of living, number of open IT positions, and projected job growth over the next 12 months and the next 5 years. CompTIA's Tech Town Index will be published annually, to capture and share important tech industry and national trends.